THE BLACK POWER MIXTAPE 1967-1975 mobilizes a treasure trove of 16mm material shot by Swedish filmmakers, after languishing in a basement of a TV station for 30 years, into an irresistible mosaic of images, music, and narration chronicling the evolution one of our nation’s most indelible turning points, the Black Power movement. Featuring candid interviews with the movement’s most explosive revolutionary minds, including Angela Davis, Bobby Seale, Stokely Carmichael, and Kathleen Cleaver, the film explores the community, people and radical ideas of the movement. Music by Questlove and Om’Mas Keith, and commentary from and modern voices including Erykah Badu, Harry Belafonte, Talib Kweli, and Melvin Van Peebles give the historical footage a fresh sound and make THE BLACK POWER MIXTAPE 1967-75 an exhilarating, unprecedented account of an American revolution. 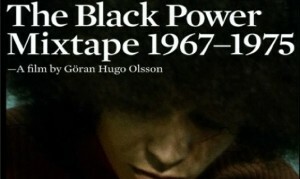 “The Black Power Mixtape” Is Getting A Theatrical Release! It’s been awhile it seems since I last wrote about this film; Goran Hugo Olsson’s The Black Power Mixtape 1967-1975, the documentary that premiered at this year’s Sundance Film Festival, and was recently acquired for distribution by Sundance Selects. I’ve seen it twice already – first at Sundance, and later at the New Directors/New Films Festival here in NYC, a couple of months ago. I also reviewed it on the old S&A site, and you can read it HERE if you haven’t already. Needless to say, I liked it! Until today, I assumed that, given that it was acquired by Sundance Selects, it would only air on cable TV, on the Sundance Channel; however, I received an email from the PR firm handling the film’s release, inviting me to upcoming press screenings in anticipation of a theatrical release that will happen later this year – specifically, as the email states, it’ll open in limited release, in New York and Los Angeles (of course), in mid-September. It doesn’t give exact dates, just “mid-September. Although, I assume we’ll have a specific date soon enough. That’s good news! Not that it’s a film that demands to be seen on the big screen, but, it certainly does enhance the experience; and I’m guessing the theatrical release is to ensure that the film qualifies for awards consideration once that season begins. I should also note that when it eventually makes its way to TV, it’ll be on PBS’ Independent Lens. Danny Glover is one of the film’s producers by the way.